I've been reading Tarot for several years. Have a pretty good grasp on it, however, I just wanted to get some other's opinions. A certain person has been in and out of my life for the last 10 years. We've had a strange/karmic connection, and have been involved somewhat. I care for this person, however, I've always balked at being in a conventional relationship with them. We go months without speaking to each other, and yet I know when they're around, thinking about me, etc. So anyway, to make a long story short, I did a one card draw tonight, and drew the Four of Wands reversed. I took this to mean as we will be together, but not in a conventional "marriage" type relationship, but perhaps living together. The funny thing is, I've often thought I could see us living together for a long time, however not marrying this person. Another strange thing, is that 4-5 months ago, I had a dream about this person. A friend of their's said to me in the dream, "he was going to ask you to marry him", and that's was the entire dream. My question is, should I take the Four of Wands reversed as validation regarding this person and the future with them? I'm sorry, but this is not a place where we can do card readings for folks. There are other forums and Yahoo groups online devoted to the study of Tarot, but even they are not too accomodating about interpreting cards for random passersby. I suggest that if you do not wish to hire a reader to divine for you, then you should study the manings assigned to the cards by traditional as well as modern authrors and empower yourself to make your own interpretations. We sell a number of excellent books at Lucky Mojo that will help you understand the meanings of the cards, both upright and reversed. Someone told me that a tarot deck will not work if a.) it doesn't have the infinity symbol somewhere on the deck (it sounds like it could be a myth because the infinity symbol is usually on the two pentacles) and that b.) you cannot buy the deck yourself, someone has to give it to you as a gift. How true are these rumors? Secondly, Tarot is a very old and mystical deck of cards. There are symbols on the cards that are associated with certain meanings and secret societies. There are so many theories on the tarot deck being this huge mystical puzzle with infinite answers (to lifes mysteries... life after death...etc), but others theorize that it was originally just meant to be a game. Does anyone know any writers or articles on this subject? Its an interesting subject. I never heard the part about the infinity symbol, I got my first tarot deck some 25 or some odd years ago, I now own about 15 decks (mostly because I just love the imagery) Some decks read better for me than others. I was taught years ago that once you obtain a deck (and I have heard the must be gifted but frankly they all seem to work for me) you cleanse the deck, then charge it to yourself, this is necessary whether it be a new or used deck. I usually smudge them (with cedar and sage because I am cherokee) then I lay them somewhere they can be kissed by moonlight overnight ( the full moon or growing moon is better in my humble opinion) Inside is ok for this, window sill, dashboard of your car, don't want the dew to fall on them and ruin them. After if they still don't feel quite "right" i set them between some powerful generator crystals (quartz that are known as generator crystals usually large palm size pieces you might need to find someone to help you with this or read the melody books or some other books on magical rocks to help you figure it out or use whatever quartz's are your favorites) and check them the next day then if they are clean I'll charge them by holding them between my palms and imagining my energy going into them filling them imagining it growing in them until they glow brightly, to brightly to look at. Now for me this is what i do with extreme decks, used decks, or "dirty" decks. If its a new deck I just do the last part the energy part as it is both cleansing and charging at the same time, and they usually work just fine with me. If a deck doesn't work for me after awhile I gift it to someone else, I'm not a big fan of holding onto magical tools that aren't for me. Sometimes a neck needs recharging, you can do any or all of those things above to recharge your deck if its picked up negative energies or has stopped working for you. Do not be afraid of used decks, I have found that they are a little less likely to work as well for you but I would say 3 out of the 4-5 used decks I have gotten worked for me even if I found someone else to gift them to later. (yea I'm tarot obsessed sorta I rescue used decks sometimes and gift them to people) Sorta like a used car, treat it good, and it will treat you good. okay, how about if you lose a deck in a move? Should you just give up forever, or are you then grandfathered into the status of being able to buy a deck? By these rules, the tarot deck industry would dry up pretty fast. Or would the oracle accept it if you "gave" someone some money and they happened to buy a deck, and they felt compelled to "give" it to you? What if you ask for a tarot deck for your birthday or Christmas? I've been reading the tarot since I was 13 or so, and haven't had any issues with using a new deck once it's been broken in by several reshufflings and an introductory reading. I've even received good divination from using online tarot generators. Some day, people will come to accept that divination is nothing to cloak in superstition, but is a mathematical effect of intention and the time/space continuum. There's nothing wrong with buying your own tarot deck. It's probably better to do it that way, so you can choose one with imagery that you respond to. 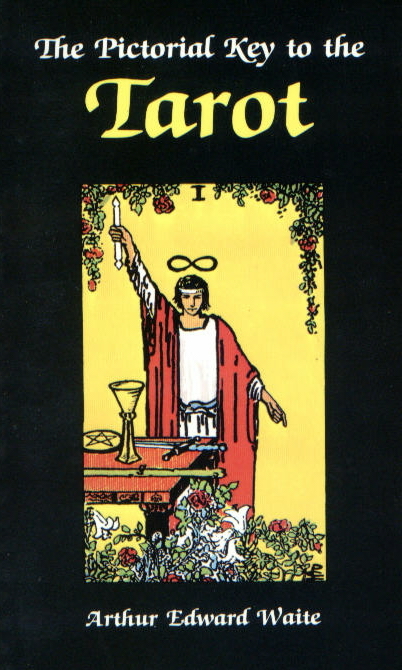 In the Rider Waite deck, the infinity symbol is above the Magician's head. Go ahead and buy the right deck for you. There are so many to choose from now, as well as non-tarot oracle decks. I can't remember where I read it, but the whole "you have to be gifted with a deck" urban legend didn't start up until the 1970's. Since the cards are way older than that, I wouldn't really pay much attention to it. I've been in the magical community for nearly 12 years now and I don't personally know anyone that subscribes to that belief. That being said, if you believe something, it will be true - so if you believe you have to be gifted with the deck for it to work, then you'll be a self fulfilling prophecy. I've used a rider-waite deck for 15 years. It was my first deck and recommend it to anyone. I have other more esoteric decks, but generally I recommend the Rider Waite, BOTA deck, or Universal Waite deck for beginners. lucky7clover wrote: Someone told me that a tarot deck will not work if a.) it doesn't have the infinity symbol somewhere on the deck (it sounds like it could be a myth because the infinity symbol is usually on the two pentacles) and that b.) you cannot buy the deck yourself, someone has to give it to you as a gift. How true are these rumors? good luck and happy tarot reading! Sorry for the strange title- I couldn't think of how else to put it with such a small character limit! I've recently done a black walnut bath and Cut & Clear spell to rid myself of unwanted feelings towards a particular girl that I've been having problems with for a while. It's been very successful, and I'm ecstatic with the results- I feel barely a twinge towards her now, rather then the resentment and obsessiveness that I used to bear. Anyways, I was just thinking about her, and wondering what was happening in her life, so I whipped out my trusty tarot cards and asked them how she was doing. I essentially got nonsensical results that didn't make sense no matter how I tried to intepret the cards.. Which was really strange considering that just a couple of moments before that reading, I was getting perfectly fine readings on other situations that didn't have anything to do with her. It doesn't bother me very much, but I just found it a little strange. Woah, I didn't think of that! Thank you very much, that helped me out- I was worrying a bit about my reading skills glitching up! I just ordered the tarot cards and they arrived today and i was wondering if there is any procedure to do before hand (i've heard of putting them underneath my pillow and stuff like that) or any sort of stuff like that that would be appropriate to do, thanks! Its up to you, really. Some people prefer to build a relationship with their particular tool. Other recognize that the tool is merely a gateway into an inner talent and so can read with any deck they come across. If you prefer to build a relationship with your cards then sleep with them under your pillow for a few nights, spend a few weeks looking through each card memorizing their symbolism and trying to grasp the inner meanings. You'll here quite abit of dogma on how to handle the cards, but ultimately the power is within you so do what helps you tap into it. Basically just cleanse them and consecrate them to your use - then find someplace to store them. There are MANY different ways to do that, and there's no one right way or better way. I usually spritz some Florida Water on them, pass them through some Frankincense, and then pray over them. Mine are stored in a cotton pouch, but some keep them wrapped in silk, or in a box. It really doesn't matter how you store them, just that they have their own place. I've never personally found any benefit to sleeping with them under the pillow - I did try that with a new deck and didn't find it helpful. I get the best result just cleansing and praying over them. I do think it is very important to cleanse it, as you would want to do with any new divination tool you get. Actually any new tool. I think the act of cleansing it is sort of like the first impression and handshake. it is important to get things off on the right foot. oops i didn't cleanse them before hand, could i still do it?? I smoke mine first with sage and then with Lucky Mojo Pyschic Vision Incense Powder. I don't sleep with them but spend a lot of time shuffling them to break them in. Yeah I do this too. I like to shuffle them and just break them in. Also, Ive noticed that when I dont cleanse them they will tell me some silly stuff or stuff that don't make sense. Has anyone ever use the New orleans voodoo deck. Those cards are wow, and amaze me. I use that deck but only for personal readings, not for customers. It's one of my favorite decks as far as images go. I am a big fan of the Hudes tarot and am really liking the art on the Paulina tarot, although I don't have that one yet. Ah, nothing but the Rider-Waite Deck for me. (Even though Waite was an insufferable fellow). I have found the various decks used to be rather artistic and often quite lovely, but I've got a good relationship with the Rider-Waite. I can use any deck to read and have often used random decks to read at odd occassions, but prefer my Rider-Waite to it all. I agree. I have a large collection of cards, and the Rider-Waite and the Robin Wood deck (which is pretty much the Rider-Waite) are the only two that I will read with. Though I still enjoy looking through the art of the others. Especially the Tarot of the Cat People - I just have a thing for animals. Divination tools generally do not like to be asked the same question multiple times - they will start giving you nonsense answers if you doubt them. You can confirm from a different angle, but asking the same question more than once generally does not yield good results. I agree asking the same question over and over is annoying to the cards. I dont know about other peoples cards, but mine have a personality of their own, and unless I am asking for clarification they do not like to be asked the same question over and over in the same session. Sometimes divination tells us what we do not want to hear. But it is something we need to hear to help the problem. My advice to you is to ask the question in a different way, or from another perspective. If you want to make sure the question is accurate ask in like a week or so...or at least a few days. Also, make sure you shuffle the cards after you answer each question and then cut the cards. Just like if you were playing a card game you want to clear the cards from the previous question so that they are not in basically the same order they were before. Sounds simple but clear the cards of the previous question helps give a more accurate answer. I know when my cards want to be put away...or they do not want to answer the question at that point in time. It is interesting. Or sometimes when I am doing a reading I have they will further elaborate on a previous question asked. Those are my rider waite cards. My new orleans voodoo cards...one time I used them in a spell, and happen to use ALL fire cards aka wand cards. Let me tell you it started a blaze with the candle I was doing. Good thing I was standing up, but the fire came up to my knees. It was definitely scary. But I do agree tarot cards seem to have a personality of their own sometimes. It takes time for you to be "in tune" with your cards. Not to mention if you keep asking them the same question over and over again...they are going to give you whack answers (see earlier in this thread). You should cleanse your cards, and just spend sometime not asking questions, but just letting them speak to you. In addition, before you start doing spreads...I would just ask a question but not yes or no. and then just take out the cards one after the other. Rather than...doing a particular spread. Then once you get good at interpreting the cards THEN move on to spreads. Also, make sure you shuffle them good in between question otherwise they are just not going to make sense or still be on the previous question before. In addition sometimes cards tell us things we cannot interpret at the time, so usually i write them down and then try to see the "theme of the cards later. Not to metnion stop asking your cards the same question to "check up" that means you do not trust the cards. Also, make sure you are clear headed, and not thinking about other stuff...otherwise it will show up in the cards. In regards to being curse or not...ive never heard of that. It would be odd to me to see that a production of cards are curse, but I could understand if a certain owner curse their deck of cards. The New orleans Voodoo cards are not curse, but I can see that they are perhaps influenced by the 7 african spirits since there is an oshun, legba, barons etc card so maybe they speak to the cards. So I dont know but they have a personality as do my rider-waite cards. I have an idea to use a skull candle that I have to help with my Tarot readings. I have Psychic Vision Sachet, Crown of Success oil and the Attraction kit -- items that I would like to use for developing my Pyschic abilities further for Tarot reading. I have heard great stuff about the Crown of Success oil so I am excited to use it. I also have Money Drawing, Steady Work, Master Key and Pay Me sachets as well. I was wondering how to combine these things in a spell to be successful in my readings. I would like to pursue this as a means for bringing in more cash flow. I have been told REPEATEDLY to do this. Even the wonderful Miss Bri has given me the go ahead. I am the only one holding myself back, I am sure. But maybe I can do a spell on myself and get this started? Here is my idea of a spell to open the road for work as a psychic reader. 1) Get business cards for your tarot reading business printed. You will also need a make-up brush. 2) When the business cards are delivered to you, open the box lid, but leave the cards in the box, and place the box on the altar. Set the make-up brush beside the. Also place your tarot cards on the altar if you keep them in a bag, take thm out of the bag and set them on top of it. 3) Combine the following sachet powders: Psychic Vision, Master Key, Attraction, Money Drawing, (I would have added Crown of Success, but you only have this in oil form, and you will use it that way.) Put the combined powders in a small saucer or mini-bowl and place that on the altar. 4) Inscribe the skull candle with your petition, using symbolical inscriptions (such as eyes, dollar signs, etc.) as well, if you have the artistic talent to do so. 5) Dress the candle with Crown of Success Oil, pray over it and light it. Pray Acts 2:17: "I will pour out of my Spirit upon all flesh: and your sons and your daughters shall prophesy!" 6) While the candle burns, take the make-up brush and dust the sides, tops, and bottoms of your stack of tarot cards, repeating Acts 2:17: "I will pour out of my Spirit upon all flesh: and your sons and your daughters shall prophesy!" 7) Naow use the make-up brush to dust the tops and sides of the business cards with the combined sachet powders, repeating for a hird time Acts 2:17: "I will pour out of my Spirit upon all flesh: and your sons and your daughters shall prophesy!" 8) Rub several drops of Crown of Success oil on the thumbs and first two fingers of both of your hands, warm your hands in the flame of the candle, and then anoint your own forehead and the crown of your head with the Crown of Success oil and pray the usual petition that goes with this oil: "May all my works be crowned with success! AMEN." Thank You so much Miss Cat. I will do this. Very helpful information! I am excited to get started. yup thats what i said. it was in my reading and i really feel utterly helpless and immoveable in my current situations . i try to figure out what to order.. i cant do it. i am utterly confuzed on what to even get. i need to get things for my works. all i know is want to break free from this prison. its maddening. what can i do or get to remove this horrific curse? These are questions you should ask your reader. Most AIRR readers can and will make suggestions on rootwork for you (this is called a spiritual consultation) and some will even walk you through the spells, step-by-step (this is called magical coaching). Tarot is something ive wanted to do for many years just somehow never got to it. what is the best book that LM sells on the subject?? Thanx I've been thinking about this for a while, I believe I have that same deck but it has the car meanings on them but I want to go deeper within the meanings of each card. I just bought Introduction to Tarot by Susan Levitt. It's really good, like a Tarot for dummies type book, great for beginners (like me). Definitely worth the $18. Not sure if this is in the right place. I was contemplating purchasing the Quick and Easy Tarot cards from LM. I have had an interest in learning tarot for a long time. I was wondering if anyone had started learning Tarot using these cards and what your opinion is about them. I received a set of tarot cards as a gift. I don't have the gift for tarot reading but was interested in learning. Quite interesting! I don't like the Quick and Easy Tarot, personally. All the hints and tips on the cards really take away from the pictures, which are the key to the work. Get yourself a deck like the Rider Waite or the Universal Waite, or one based closely thereon. I'll PM you with my favorite title for learning. Also, a couple of tips that I and other readers have found extremely helpful - firstly, ask the spirits to aid you in your quest to learn, and ask them each time you sit down to study and practice. There are many different spirits and angels of divination out there, you can ask your ancestors to guide you to one that is appropriate. Secondly, do an invocation or petition to that spirit/spirits before actually reading, and ask them to help make the meanings clear to you. This will really help you get to deeper levels in an expedient way. But you still have to do the work, of course!! Finally, using condition products like Psychic Vision and Spirit Guide and Master Key can really help you get an edge in your divination work. I recently got the Rider Waite tarot deck and have been studying about divination using Tarot Cards. My question is, is there a good spread to give a definite answer to yes/no questions? I've read that one shouldn't divine yes/no questions using the Tarot, but I have also seen yes/no Tarot spreads. Any advice will be greatly appreciated. Once you know tarot, you can really go about that in an infinite number of ways. I normally do one or three cards for a yes/no reading. However, with the tarot, you'll always be getting a complex layered answer. If you want a strictly yes/no divination tool (not that it only does that, just that it will provide a hard yes/no without layers of symbolism), try using a pendulum. Whatever deck you decide to go with take time to get adjusted to them and learn to really develop a relationship with them. Divination is about the ability to see the connectedness of events, symbols etc. The use of Psychic Vision products can help you a great deal. Burning a bit of incense and carrying a mojo hand can help you unlock your inner ability to read. Obviously anyone can shuffle the deck, lay out some cards and interpret them, but do you have to have psychic abilities or some kind of special talent for the readings to be accurate? Are they accurate for anyone who uses them? I do have Introduction to Tarot and a couple other books, and I think I have some ability (I got a reading from a professional at LM who actually pulled a few of the same cards I had pulled, and the reading had the same outcome I had gotten), but it's hard for me to interpret the cards sometimes because if their meaning isn't obvious, I want them to mean what I think they should mean. Know what I mean? Would the psychic power-enhancing supplies (oils, incense, etc.) at LM help to make the cards easier to interpret? I also heard it's easier to read for other people than to read for yourself (perhaps because of what I mentioned above about interpreting the cards to mean what you want them to). Is there much truth to that? luckycharms13, interpretation is personal, two persons can read (for you) and interpret the same situation differently...the same goes for you, I have not used the Psychic Power supplies but try them for yourself and tell us your result. I have also heard that reading for yourself is difficult ... but again thats a personal opinion. There are different forms of divination and some forms are better suited to individuals than others. Pendulums are a great place to start as nearly anyone can learn to use it on the most basic yes/no level. That way you can have a divination tool you can use while you are learning more complex systems such as tarot. The complex systems can take a good while to learn well, and then of course you tie your intuitive gifts into it for the most insightful and accurate divinations. Depending on how quickly you learn on an academic level, along with how long it takes you to develop your intuitive talents in conjunction with that system can result in vastly different amounts of time that it will take someone to become skilled at a form of divination. And using products like Psychic Vision, as well as learning skills such as meditation and other exercises for expanding your intuitive gifts can help you a great deal along the way. Praying to your guides to help open you up and expedite your learning can also go a long way. I found that's what really made it "click" for me. I just started reading for a line the other day, and I want to cleanse my cards every night when I log out. Right now, I'm using salt and my breath (sprinkling salt on them, flipping the salt throughout them, then blowing the negativity away). I'd much rather use powders to sprinkle/dust them with, or incense to aerate them with. If anyone has any recommendations, I'd appreciate it. Also, any recommendations for oils I can add to my body wash or whatnot to cleanse myself from the negativity? Again, been using salt because that's all I have on hand for cleansing right now. Thank you very kindly! I prefer incense for cleansing items like cards -- you can do doube duty by wafting them through a cleansing incense like Van Van in the evening and then a spiritually effective incense like Psychic Vision in the morning. Antoher method is to make a little sachet of Van Van (like a clothes sachet) and lay them on that overnight. To calm the fraught energy you get from upset clients, spray Peace Water in the bathroom or in your reading area. For removal of negativity from your hands and face or whole body, try Chinese Wash or a few drops of Van Van oil in your body wash.
Oh absolutely! I regularly cleanse my cards and other divinatory tools by smoking them in incense then followed up by smoking them with Psychic Vision and Master Key incense. I've also dusted by cards with Psychic Vision powder and my tray for geomancy has Psychic Vision powder mixed into the sand. The practice as outlined by Miss cat can really help clear away and negativity you pick up while honing your inner intuitive and psychic abilities. Thank you both most kindly. My order list just grew longer ...but for now, I don't have Van Van or Psychic Vision or Master Key incenses. Would Money House Blessing (for the blessings to help cleanse them) or Crown of Success work as suitable substitutes until I can get my next order in and back? The only other incenses I have on hand are Money Stay With Me and Five Finger Grass. One other question, and y'all can laugh at me all y'all want. But I live in a small apartment, and the only floors that I could use floor wash on are my w/c and kitchen. So do I sprinkle or spray Chinese Wash or other washes on my carpeted floors to cleanse them? Because it's not long till my giant fall cleaning, and I'd like to go through and really clean out all this leftover negativity and emotional distress from this household for the winter (since we'll be inside more, and it could bring fights and depressions around, like I need more of that). Crown of Success is more all-purpose than Money House Blessing, and since you do your tatot readings out of your house, then Money House Blessing would always be a nice adjunct to any success work you are doing in that area of work -- but niether of these are for cleansing away negativity, which was the original query. Scroll down to the section on carpeted floors. I like to sage my cards, and before I touch them I cleanse my hands with diluted ammonia, or florida water. When working with them I like to use psychic vision incense, and dab a bit of oil on my hands as well. It definitely makes a difference. I agree that the best book from LM is the Pictorial Key by Waite. He is the one who designed commissioned the Rider_waite deck , it was drawn up by Pamela Coleman Smith. Typically this card signifies two people or a relationship with a positive connotation to it. Tarot is not my specialty, although readings I have done in the past (for others, not myself) always tend to ring very true. I just performed a reading regarding my husbands search for employment and the result card was a 2 of cups. I've never thought of this card as being an indicator of employment, although I suppose it could be. Could I be right or am I way off base?